New Delhi, Mar 06: IAF Wing Commander, Pilot Abhinandhan Vardhamaan said to be a youth icon in the nation. People following Abhinandhan hairstyle, Mustache and sarees with his photo print has been increasing timely. Nonetheless, the social media posts including Abhinandhan has been increasing day-by-day. However, the Indian Air Force has made it clear that there is no any connection between Abhinandhan and those IDs, social media posts. It is true that some people have created fake accounts in the name of Abhinandan and have been posting the posts, and the fact is that Abhinandan has no account in social media so far, tweets Indian Air Force. Abhinandan appealed to none of the social networking sites like Facebook, Twitter, and Instagram and asked not to follow the fake attempts. 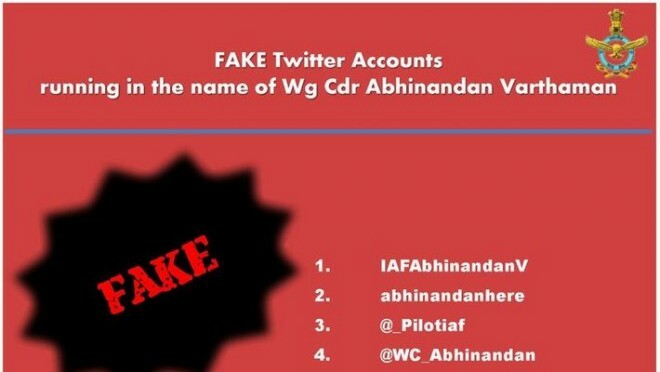 IAFAbhinandanV, abhinandanhere, @_Pilotiaf, @WC_Abhinandan, @AbhiNandan_Wcdr, @W_abhinandan..
Informing people to be careful with reagard to the Wing Commander accounts. The IAF said in their tweet that they are fake accounts in the name of Abhinandhan.